Charlie Anderson, a widower, lives with his large family in the Shenandoah Valley in Virginia, during the American Civil War. 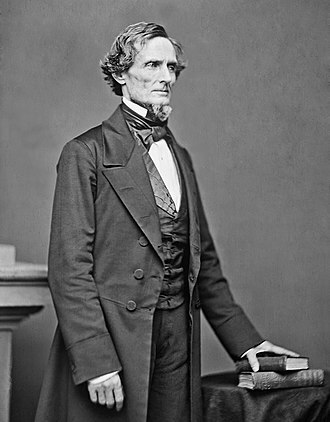 Anderson does not wish to be involved with the war because he doesn't consider it "his" war, but he is forced to take action when his youngest son Robert is taken prisoner by Union soldiers. In the course of searching for Robert, Charlie, his daughter Jenny, and some of his sons rescue Sam (Jenny's newlywed Confederate soldier husband) from a Yankee POW train. After enduring the tragedy of losing his eldest son Jacob (to a sniper) and his second eldest son James and James' wife Anne (to deserters), Charlie and the rest of the family return home, defeated. In his despair, Charlie is reminded to return to church, where he, at long last, is reunited with Robert once more. The play was first performed at the Goodspeed Opera House in East Haddam, Connecticut, during 1974. It transferred to the Alvin Theatre on Broadway beginning on January 7, 1975. where it played for a total of 1,050 performances, ending August 7, 1977. The cast featured John Cullum (Charlie Anderson, the main role), Joel Higgins (James), Penelope Milford (Jenny), Robert Rosen (Henry), Ted Agress (Jacob), Gordon Halliday (Sam), Chip Ford (Gabriel), Joseph Shapiro (Robert, the boy), David Russell (John), Jordan Suffin (Nathan), Gary Harger (Corporal), Charles Welch (Rev. Byrd), and Donna Theodore (Anne), who won a Drama Desk Award for her performance. The cast also included Betsy Beard, Tedd Carrere, Stephen Dubov, Gary Harger, Brian James, Robert Johanson, Sherry Lambert, Craig Lucas, Gene Masoner, Paul Myrvold, Dan Ormond, Casper Roos, J. Kevin Scannell, Jack Starkey, E. Allen Stevens, Marshall Thomas, Matt Gavin, Edward Penn, and Ed Preble. The production was directed by Philip Rose, with scenery by Chuck Murawski, lighting by Thomas R. Skelton, costumes by Pearl Somner and Winn Morton, choreography by Robert Tucker, dance arrangements by Russell Warner, musical direction by Lynn Crigler, and orchestrations by Don Walker. 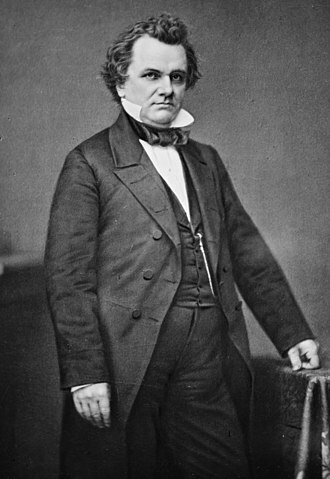 Michael P. Price was executive director of the Goodspeed Opera House. The production was nominated for six Tony Awards, including Best Musical, and won two: one for Best Actor in a Musical (John Cullum) and the other for Best Book of a Musical. Shenandoah was revived at the Virginia Theatre on Broadway, again with Cullum in the main role, on August 8, 1989, and ended September 2, 1989. It returned to the Goodspeed Opera House during 1994, featuring Marc Kudisch. A new production began on March 22, 2006 at Ford's Theatre in Washington, D.C., featuring Scott Bakula. A positive critical response and strong sales resulted in the run being extended through May 21, although Bakula left the production April 30. ^ Klein, Alvin (August 21, 1994). "After 20 Years, Goodspeed Opera's 'Shenandoah' Back Again" The New York Times. Hello, Dolly. was first produced on Broadway by David Merrick in 1964, winning a record 10 Tony Awards, including Best Musical, a record held for 37 years. An Original Cast Recording was inducted into the Grammy Hall of Fame in 2002, the album reached number one on the Billboard album chart on June 6,1964 and was replaced the next week by Louis Armstrongs album Hello, Dolly. The show has one of the most enduring musical theatre hits, with four Broadway revivals. 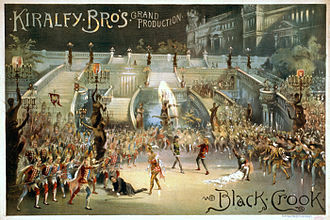 It was made into the 1969 film Hello Dolly. that was nominated for seven Academy Awards, originated in an 1835 English play, A Day Well Spent by John Oxenford, which Johann Nestroy adapted into the farce Einen Jux will er sich machen. The Matchmaker became a hit and was revived and made into a 1958 film of the same name starring Shirley Booth. The story of a widow who strives to bring romance to several couples. The role of Dolly Levi in the musical was written for Ethel Merman. Eventually, he hired Carol Channing, who created in Dolly her signature role. Director Gower Champion was not the producers first choice, as Hal Prince, Dolly. 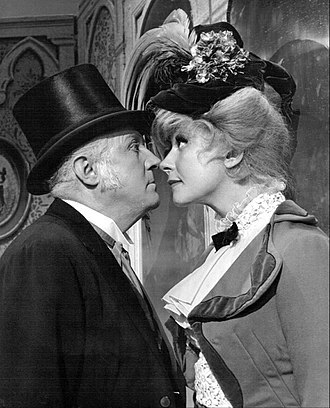 had rocky out-of-town tryouts in Detroit and Washington, D. C. After receiving the reviews, the creators made major changes to the script and score, the show was originally entitled Dolly, A Damned Exasperating Woman and Call on Dolly but Merrick changed the title immediately upon hearing Louis Armstrongs version of Hello, Dolly. The show became one of the most iconic Broadway shows of its era, the half of the 1960s, running for 2,844 performances. During that decade, ten blockbuster musicals played over 1,000 performances, Tams-Witmark Guide to Musical Theatre Masterworks Broadway As the 19th becomes the 20th century, all of New York City is excited because widowed but brassy Dolly Gallagher Levi is in town. Dolly makes a living through what she calls meddling – matchmaking and numerous sidelines, including dance instruction and she is currently seeking a wife for grumpy Horace Vandergelder, the well-known half-a-millionaire, but it becomes clear that Dolly intends to marry Horace herself. The Neil Simon Theatre, formerly the Alvin Theatre, is a Broadway venue built in 1927 and located at 250 West 52nd Street in midtown-Manhattan. As of 2011, the record for its longest running show is held by the musical Hairspray, which opened August 15,2002, and ran for 2,642 performances before closing on January 4,2009. Designed by architect Herbert J. Krapp, the developer, real estate mogul Alexander Pincus originally named it the Alvin Theatre as an amalgam of the names of producers ALex Aarons and VINton Freedley. It opened on November 22,1927, with George and Ira Gershwins Funny Face starring Fred and Adele Astaire. In 1930, Ethel Merman made her Broadway debut in Girl Crazy, in 1934, she appeared again in Cole Porters Anything Goes and again in 1936 in Porters Red and Blue. In 1935, the Gershwins American folk opera Porgy and Bess had its premiere at the venue. 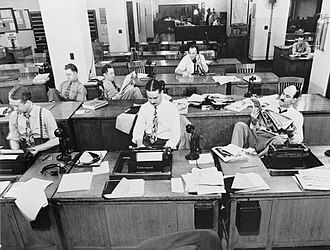 Due to the Great Depression and Freedley lost control of their venue in 1932, for a period, CBS used it as a radio studio. In 1960, Lucille Ball appeared in her only Broadway show, in 1965, Liza Minnelli made her Broadway debut in Flora the Red Menace. The original Broadway production of Annie opened in 1977 and ran for six years. In 1977, the Nederlander Organization purchased the structure and renamed it in honor of American playwright Neil Simon on June 29,1983, in 1985, its sequel Biloxi Blues played at the theatre. 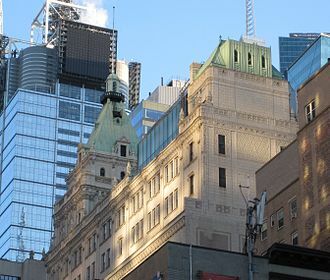 The New York City Landmarks Preservation Commission designated the building a New York City landmark in 1985. Historical records show that the seating capacity was 1,362, in 2002, it expanded from 1,328 to a potential 1,467 after the May 27,2002. Robin Williams was to perform five shows of his tour, Weapons Of Self-Destruction at this theatre in early April 2009. In lieu of Williams, the revival of Ragtime, opened November 15,2009, after a run at the Kennedy Center in Washington. It closed January 10,2010, due to low sales after only 28 previews and 57 regular performances. The new musical Catch Me if You Can began previews on March 11,2011, on September 4,2011, Catch Me If You Can closed after 32 previews and 170 regular performances. The Shenandoah Valley /ˌʃɛnənˈdoʊə/ is a geographic valley and cultural region of western Virginia and the Eastern Panhandle of West Virginia in the United States. The cultural region covers a area that includes all of the valley plus the Virginia highlands to the west. It is physiographically located within the Ridge and Valley province and is a portion of the Great Appalachian Valley, named for the river that stretches much of its length, the Shenandoah Valley encompasses eight counties in Virginia and two counties in West Virginia. It has been described as being derived from the Anglicization of Native American terms, resulting in such as Gerando, Genantua. The meaning of words is of some question. Schin-han-dowi, the River Through the Spruces, On-an-da-goa, the River of High Mountains or Silver-Water, the most popular, romanticized belief is that the name comes from a Native American expression for Beautiful Daughter of the Stars. Another legend relates that the name is derived from the name of the Iroquoian chief Sherando, Opechancanough liked the interior country so much that he sent his son Sheewa-a-nee from the Tidewater with a large party to colonize the valley. Sheewa-a-nee drove Sherando back to his former territory near the Great Lakes, according to this account, descendants of Sheewanees party became the Shawnee. According to tradition, another branch of Iroquoians, the Senedo and they were exterminated by Southern Indians before the arrival of white settlers. 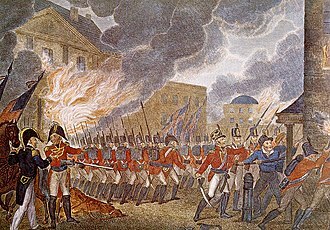 Another story dates to the American Revolutionary War, throughout the war, Chief Skenandoa of the Oneida, an Iroquois nation based in New York, persuaded many of the tribe to side with the colonials against the British. Four Iroquois nations became British allies, and caused many fatalities, Skenandoa led 250 warriors against the British and Iroquois allies. According to Oneida oral tradition, during the winter of 1777-1778 at Valley Forge. The Oneida delivered bushels of dry corn to the troops to them survive. Polly Cooper, an Oneida woman, stayed some time with the troops to them how to cook the corn properly. General Washington gave her a shawl in thanks, which is displayed at Shako, wi, many Oneida believe that after the war, George Washington named the Shenandoah River and valley after his ally. Goodspeed Musicals is a non-profit organization dedicated to the preservation and advancement of musical theater and the creation of new works, located in East Haddam, Connecticut. A distinctive feature of the view from the Connecticut River, the Goodspeed Opera House is the birthplace of some of the worlds most famous musicals, including Annie, Man of La Mancha, the Opera House was originally built by a local merchant and banker, William Goodspeed. Construction began in 1876 and finished in 1877, despite the name, it was not in fact an opera house, but rather a venue for presenting plays. Its first play, Charles II, opened on October 24,1877, the building is unique for a theater. The theater itself is located on the top two floors of the building making for interesting and sometimes difficult scenery and show load-ins. Scenery is loaded-in from the area up a vacant elevator shaft that is now outfitted with a winch system to haul the scenery up to the stage level. Much care has to be taken in order to get the scenery up the shaft without scratching or ruining the scenery, Goodspeed Musicals was formed in 1959 by a group of concerned citizens after the state of Connecticut had condemned the building. The state agreed to sell the building to the group for one dollar, provided they acquire enough funding to restore, the restoration project took nearly four years, and the Goodspeed Opera House was rededicated on June 8,1963. The first performance in the new house was Oh, Lady. Under the direction of Michael P. Price since 1968, Goodspeed Musicals has sent 19 productions to Broadway, in 1984, Goodspeed Musicals added a second performance venue—the Norma Terris Theatre—in nearby Chester, Connecticut. 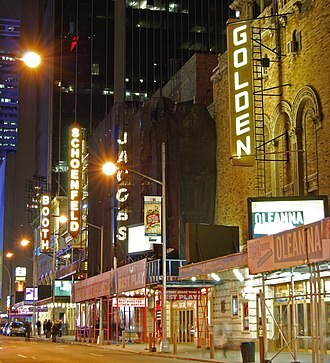 While the main stage presents a mixture of revivals and new musicals as part of its 3 production season, several original plays debuted there or at the opera house before going on to Broadway and winning Tony Awards. Goodspeed Musicals has built state-of-the-art production facilities including shops, costume shops. Critic fellows from the Eugene ONeill Theater Center in Waterford, CT travel to the Goodspeed each summer to practice reviewing full productions, tours of many of the Goodspeed facilities can be scheduled in advance for a small fee. 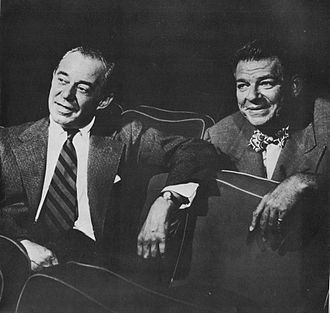 Oscar Greeley Clendenning Hammerstein II was an American librettist, theatrical producer, and theatre director of musicals for almost forty years. Hammerstein won eight Tony Awards and two Academy Awards for Best Original Song, many of his songs are standard repertoire for singers and jazz musicians. Hammerstein was the lyricist and playwright in his partnerships, his collaborators wrote the music, South Pacific, The King and I, and The Sound of Music. Oscar Greeley Clendenning Hammerstein II was born in New York City and his grandfather was the German theatre impresario Oscar Hammerstein I. His father was from a Jewish family, and his mother was the daughter of Scottish and English parents, although Hammersteins father managed the Victoria Theatre for his father and was a producer of vaudeville shows, he was opposed to his sons desire to participate in the arts. Hammerstein attended Columbia University and studied at Columbia Law School until 1917, as a student, he maintained high grades and engaged in numerous extracurricular activities. These included playing first base on the team, performing in the Varsity Show and becoming an active member of Pi Lambda Phi. When he was 19, and still a student at Columbia, his father died of Brights disease, June 10,1914, symptoms of which doctors originally attributed to scarlet fever. On the train trip to the funeral with his brother, he read the headlines in the New York Herald, the New York Times wrote, the Barnum of Vaudeville, Dead at Forty. Two hours later, taps was sounded over Broadway, writes biographer Hugh Fordin, after his fathers death, he participated in his first play with the Varsity Show, entitled On Your Way. Throughout the rest of his career, Hammerstein wrote and performed in several Varsity Shows. After quitting law school to pursue theatre, Hammerstein began his first professional collaboration, with Herbert Stothart, Otto Harbach and he began as an apprentice and went on to form a 20-year collaboration with Harbach. Out of this came his first musical, Always You, for which he wrote the book. Joel Franklin Higgins is an American actor and singer with a stage career spanning over 30 years. A graduate of Michigan State University where he was a member of Delta Tau Delta International Fraternity, after leaving with a degree in advertising and working for six months for General Motors, Higgins went to Europe to perform. In 1968, Higgins enlisted in the United States Army and was stationed at Camp Casey in Korea, following his Army days, he and several friends wrote a musical revue called The Green Apple Nasties. After leaving the Army, he sold the show to a producer, during a performance in Louisville, Higgins was approached by a producer who asked him to play Sky Masterson in a local theater production of Guys and Dolls. He went on a 17-week tour of the Midwest in the role, in 1973, Higgins landed the role of Vince in the first national tour of Grease, where he stayed for a year before leaving to join the pre-Broadway tryout of a new musical called Shenandoah. In 1975, he won the Theatre World Award for his role in the Broadway version of Shenandoah, in the same year, he began the role Bruce Carson in the CBS soap opera Search For Tomorrow, and in the following year he returned to Broadway for Music Is. In 1978, Higgins was featured in the role of Ben Gant in the Broadway musical Angel, while the show only ran for five nights, Higgins received a Drama Desk Award nomination for his performance. Higgins made the transition from daytime to primetime in 1979, with a role in the short-lived ABC television series Salvage 1 with Andy Griffith. ABC delayed renewing the series, and it was canceled after one season when Higgins signed to star in another series, during the late 1970s and early 1980s, he appeared in several movies, including Bare Essence, First Affair, and Killing at Hells Gate. He continued to perform on stage in the musicals She Loves Me, Music Is, and Camp Meeting, as well as writing jingles for Kool-Aid, I Cant Believe Its Not Butter. M&Ms, and the song for Lucille Balls comeback series Life With Lucy. 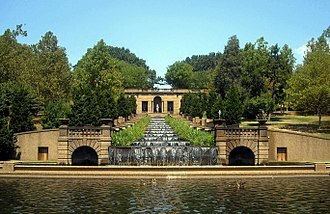 Higgins has performed in theaters around the country including The Muny in Forest Park in St. Louis. In 1982, Embassy Television and NBC created the TV series Silver Spoons, Higgins played Edward W.
Shenandoah is a 1965 American Civil War film starring James Stewart, Doug McClure, Glenn Corbett, Patrick Wayne, and, in their film debuts, Katharine Ross and Rosemary Forsyth. The film was directed by Andrew V. McLaglen, the American folk song Oh Shenandoah features prominently in the films soundtrack. 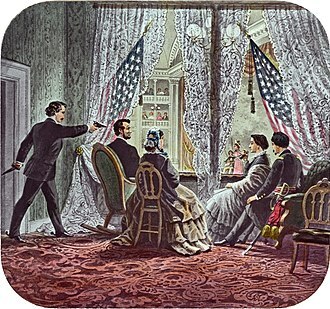 Though set during the Civil War, the films strong antiwar, upon its release, the film was praised for its themes as well as its technical production. Though Charlie attends church weekly and considers himself a God fearing man, he doesnt give God credit for anything and he internally blames God for taking his wife from him. His family is constantly late for church and will force out of their seats to make room for his family, much to the annoyance of the preacher. Charlies oldest son Jacob wants to join the war, but Charlie repeatedly tells his family that they wont join the war until it concerns them, although a few of the boys want to join, they respect their fathers wishes and remain on the farm. Charlies daughter Jennie is courted by a young Confederate officer named Sam and he wants to marry Jennie, and when Charlie gives his permission, the wedding occurs a few days later. As soon as the vows are said, a corporal rides up, Sam leaves, much to the sorrow of his new bride. Shortly after Sam leaves, Ann goes into labor, giving birth to a girl whom they name Martha in honor of Charlies late wife. While out hunting raccoon, Charlies youngest son Boy and his friend Gabriel stumble onto a Confederate ambush and they run away and stop for a drink at a pond. Boy is wearing an old rebel soldier kepi cap that he found at the river, when a union patrol comes on them, they take Boy as a prisoner of war, mistakenly thinking he is a rebel soldier. Gabriel runs to tell the Andersons what happened, when Charlie hears the news, he and his sons and daughter Jennie leave to look for Boy, leaving James and his wife Ann at the farm with their young baby. However, the captain refuses to allow Charlie to look through the cars. The August Wilson Theatre, located at 245 West 52nd Street in midtown Manhattan is a Broadway theatre. Designed by architects C. Howard Crane and Kenneth Franzheim and constructed by the Theatre Guild, it opened as the Guild Theatre in 1925 with a revival of George Bernard Shaws Caesar, in 1943, the building was leased to WOR-Mutual Radio as a studio. The American National Theater and Academy purchased it in 1950 and renamed it the ANTA Theatre, in 1981, the theatre was purchased by Jujamcyn Theaters and named the Virginia Theatre for owner and Jujamcyn Board member Virginia McKnight Binger. After her husband James H. Bingers death in 2004, producer and he told the New York Times he had a long-standing understanding with Binger that he would buy the corporations five playhouses. The theatres had a net asset value of $30 million. On October 16,2005, fourteen days after American playwright August Wilsons death,1926, Pygmalion 1928, Major Barbara 1931, Mourning Becomes Electra 1936, And Stars Remain with Clifton Webb as Overton Morrell. Bust of Nathan Hale located in the center of town.